EUROPEAN CHURCHES DESECRATED BY MUSLIMS WHILE EUROPE’S ELITES WHINE ABOUT MINARET BAN……. – The Tundra Tabloids……. 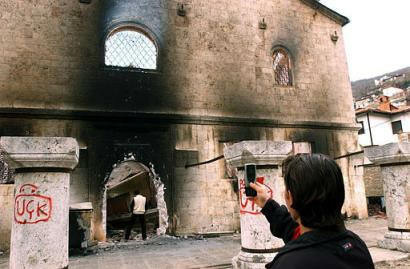 EUROPEAN CHURCHES DESECRATED BY MUSLIMS WHILE EUROPE’S ELITES WHINE ABOUT MINARET BAN……. In early 2001 the world was alarmed by reports that the Afghani Talibs destroyed the gigantic statures of Buddha, unique monuments of ancient culture. At that time the topic of prostrate sculptures firmed up in the headlines of major newspapers and news reports from leading TV networks. Almost unnoticed against this background was another tragedy, which had begun a little earlier and continues to this day, namely, the destruction of monasteries and churches in Kosovo. It did not happen in a remote country where the Talibs exercised complete sway, it, the crucifixion of Kosovo, was taking place in the very center of Europe, before the very eyes of peacemakers from the most developed countries. The Albanian extremists were finishing now what they had no time to complete during World War II. According to the data from the Serbian Orthodox Church, nearly 150 churches and monasteries have been destroyed for the last five years in Kosovo and Metochia, the cradle of Serbian Orthodoxy. NOTE: Kosovo Church-piss picture and story via the ROP. Previous Post Previous Post RETIRED US GENERAL CALLS IT LIKE IT IS: FORT HOOD MASSACRE WAS AN ACT OF ISLAMIC TERRORISM……. Next Post Next Post UK: MUSLIM HONOR RELATED CRIMES SURGE DUE TO RISE IN TRUE BELIEVERS IMITATING THE WAYS OF THEIR ISLAMIC PROPHET…….